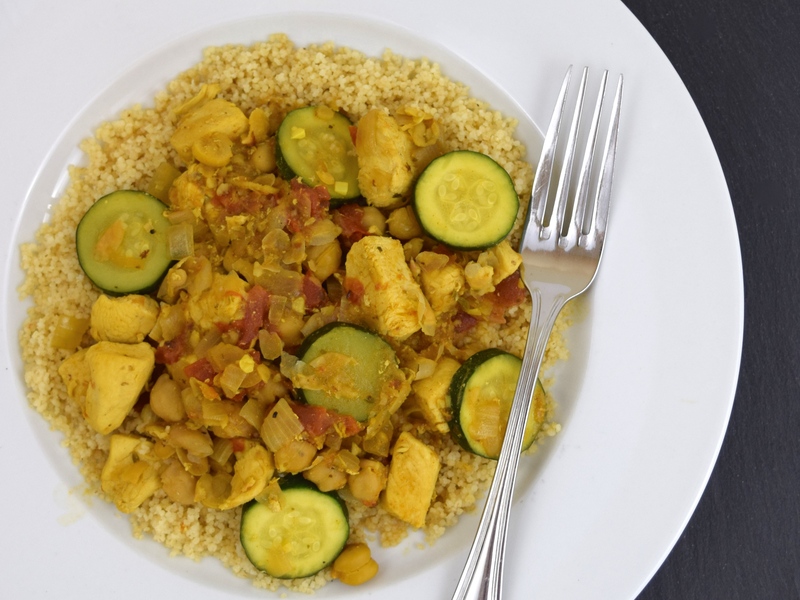 This dish is based on a North African classic, which combines chicken, garbanzo beans and zucchini with a cumin spiced chicken broth. You can use a whole chicken, cut into 8 pieces, but I chose to use skinless chicken breast, cut into 1-inch cubes. I also decided to use whole wheat couscous for its nutritional value and extra fiber. 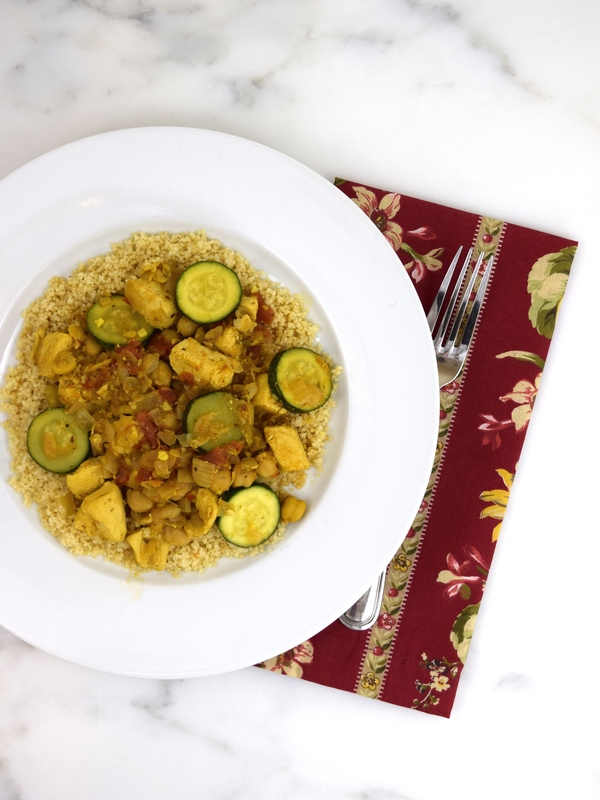 By eliminating the chicken and using vegetable broth, instead of chicken, it can easily be made into a deliciously healthy vegetarian dish. Just add more beans and zucchinis. This flavorful recipe was adapted from Food and Wine, Recipe of the Day, April 2011. Heat oil in a large pot over medium high heat. Add chicken and season with salt and pepper to taste. Cook for approximately 6 minutes, until chicken is no longer translucent and cooked through. Remove chicken and place in a dish on the side. In the pot over low-medium heat, cook onions until translucent. Add the garlic, ginger, paprika, cumin, oregano and turmeric. Stir and cook for about 30 seconds. Add the broth and tomatoes. Scrap the bottom of the pot to remove any brown bits. Add salt to taste. Cover and simmer for 10 minutes. Add chicken, beans and zucchini. Cover and simmer for another 10 minutes, until zucchini is cooked. Add the parsley and lemon juice and serve over the couscous. 4 servings. Chicken and zucchini combo looks great! Welcome to Fiesta Friday. 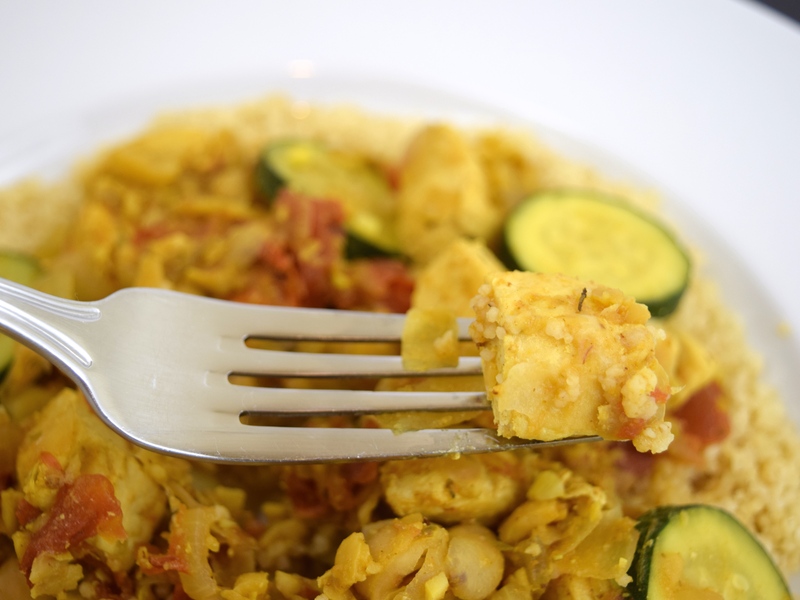 Love all the ingredients in this North African classic. Good healthy, vibrant flavors with the chicken, and veggies going on. It’s great to spruce up couscous isn’t it? One can go absolutely creative with all kinds of additions. Thanks for bringing this to Fiesta Friday. Thank you for your kind comment, Loretta!